The Health Museum will open its first permanent exhibit in five years. 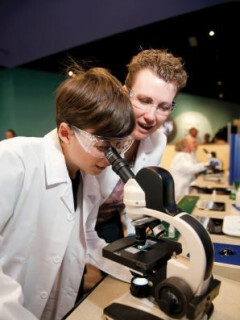 Located in the Sue Trammell Whitfield Gallery, the DeBakey Cell Lab features seven authentic biology-based science experiments developed for visitors ages seven to adult. From cheek cell analysis, ideal for young visitors, to DNA extraction for budding scientists, there is a fascinating experience awaiting all. Honorably named after the respected and accomplished medical pioneer Dr. Michael E. DeBakey, the exhibit is designed to inspire interest and educate the public in biology and medicine as well as inspire future scientists and leaders in the medical field. Though Cell Lab exists in Colorado, Maryland and Minnesota, The Health Museum's $1.2 million, 2,000-square-foot DeBakey Cell Lab is the largest and only bilingual (English/Spanish) Cell Lab in the country. It is also the only science exhibit of its kind to include two complete labs.